I love discovering new products for foodies-- and I especially love when I have the opportunity to try a bunch of new to me foods at one time. And with a monthly delivery from Degustabox, you can too! 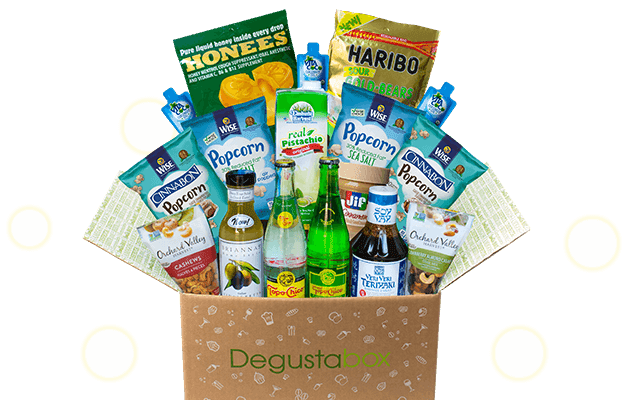 Degustabox is a subscription service aimed at introducing its subscribers to new and diverse food products every month. It only costs $19.99/month (including shipping) and each box arrives with 10-15 products typically worth over well over the $19.99 subscription fee. So not only is it a fun concept and a great way to discover new foods, it's also a really good value. They're based in Barcelona and have already been delighting subscribers every month in Spain, Italy, France, Germany, and the UK. They just launched in the United States in June and I had the privilege of receiving my very own Degustabox! Topo Chico Mineral Water in Original and Twisted Lime flavors - Perfect for enjoying on a sunny afternoon on my deck. Haribo USA Sour Gold Bears - Alex claimed these for himself as soon as he saw them. I managed to sneak one before he finished them off. They're nice and tart without that awful blistering-your-tongue feeling you get from other sour gummy candies. 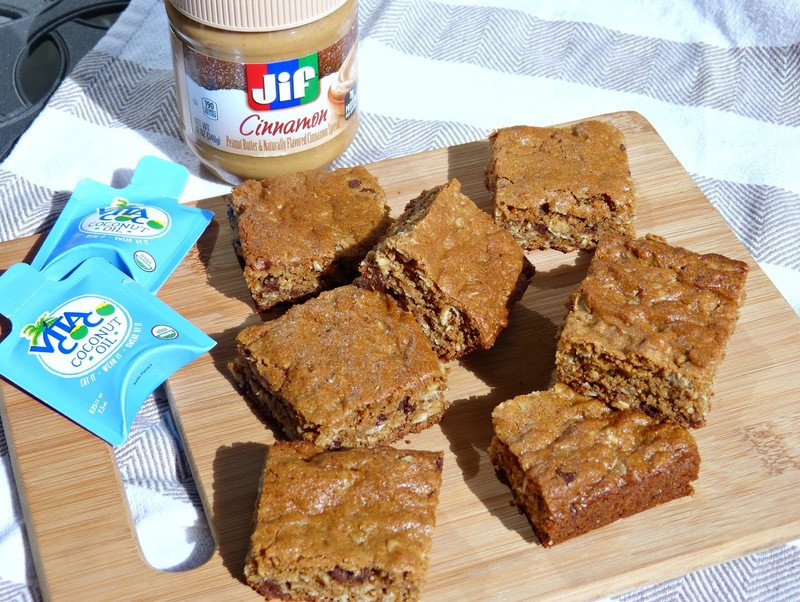 Jif Cinnamon flavored peanut butter spread - scroll down for a yummy recipe using this product! Soy Vay Veri Veri Teriyaki Sauce & Marinade - I used this sauce to make a super easy and delicious dinner. Add half a bottle of Veri Veri Teriyaki and a 1-lb. pork tenderloin to your slow cooker and cook on low for 8 hours. Serve with additional sauce (to taste) and sauteed veggies (I used snow peas and bell peppers) over rice. So so good! Vita Coco Coconut Oil - scroll down for a yummy recipe using this product! Elmhurst Harvest Real Walnut Milk - Some boxes will receive pistachio or almond milk instead. A pretty nice haul, right? There are a lot of box subscription services out there these days, but this is definitely one of the most fun if you're a food lover like me. So If you'd like to give Degustabox a try for yourself, you're in luck because I have TWO exciting deals to share with you! The first is a GIVEAWAY! 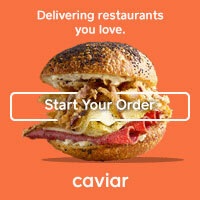 Use the Rafflecopter widget below to enter to win one free Degustabox. And if you're interested in signing up for a subscription, use code URA6M when you sign up to receive 50% off the first box in your membership-- that's just $9.99 instead of the standard $19.99! And for a little taste of how I've used some of the ingredients included in my Degustabox, I'm sharing a recipe with you today too! 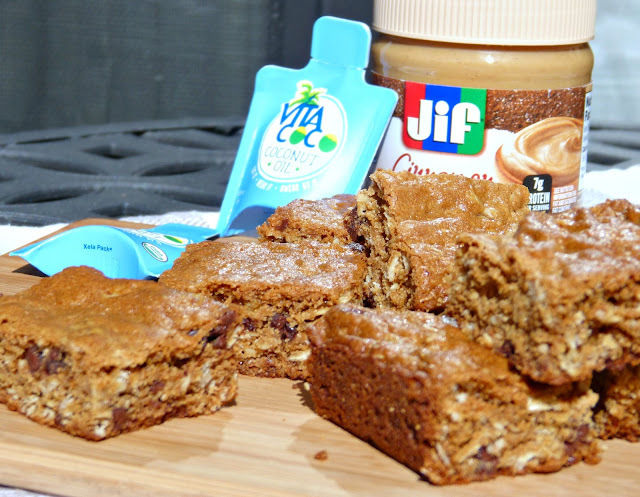 These cinnamon peanut butter snack bars are a little healthier than cookies, but definitely more decadent than a granola bar so they're perfect for enjoying as a snack at any time of the day. I froze a few so that I can pack them up and take them to work with me. 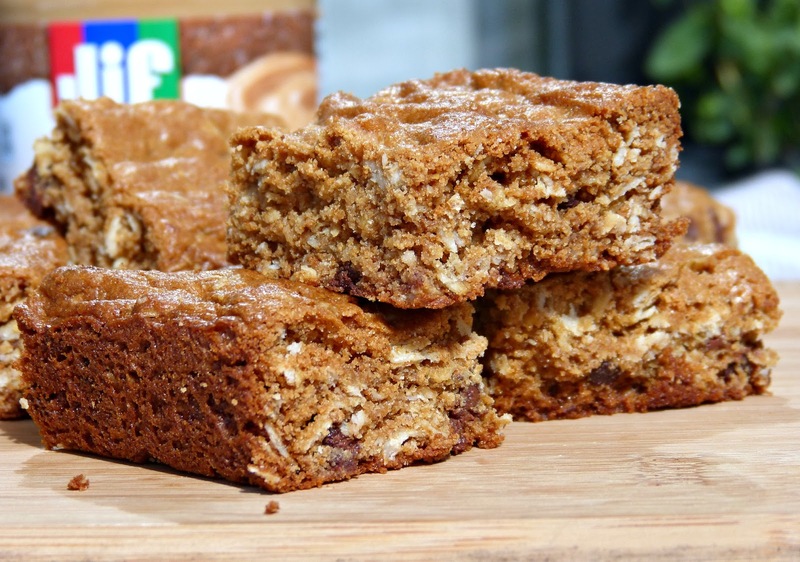 These bars aren't super sugary (which is exactly what I was going for), but get great flavor and a touch of sweetness from a combination of Jif Cinnamon peanut butter spread, brown sugar, and honey. They're chewy, filling, and actually pack some whole grains with the additions of old fashioned oats and whole wheat flour to the dry ingredients. And one of my favorite tricks for upping the healthy factor in a baked good (without ruining it) is to swap out half the butter for coconut oil. It doesn't add any coconut flavor, but still adds that richness you want from butter along with tons of health benefits. The end result is a dense and chewy bar with a sweet and nutty cinnamon peanut butter flavor studded with a few mini chocolate chips because-- let's face it-- chocolate makes everything better! Place butter and coconut oil in a large glass mixing bowl and microwave on medium low until completely melted. Add peanut butter, brown sugar and honey to the melted butter and coconut oil while still warm and stir well until smooth and fully combined. Allow mixture to cool to room temperature. In a separate medium mixing bowl, whisk together flours, oats, baking soda, salt, and cinnamon. Once the peanut butter mixture has cooled, beat in the eggs and vanilla until fully incorporate. Add the dry mixture in gradually (I find that adding it in 3 or 4 parts works well), mixing until combined before adding more of the dry ingredients. A very smooth almost dough-like batter will be formed. Gently fold in the chocolate chips. Spoon the batter to the prepared baking dish and use a rubber spatula to spread it out evenly. Bake until golden and just brown around the edges, about 25-28 minutes. You'll want to insert a toothpick to test the center. Remove from the oven and let the bars cool slightly. Carefully invert onto a metal rack and allow to cool completely. Slice into squares and serve. Editor's Note: A complimentary Degustabox was provided to me in order to faciliate this post. As always, all opinions expressed herein are my own.